Gundoc is taking up the microphone. Bookmark this. Interesting things are going to be happening there. 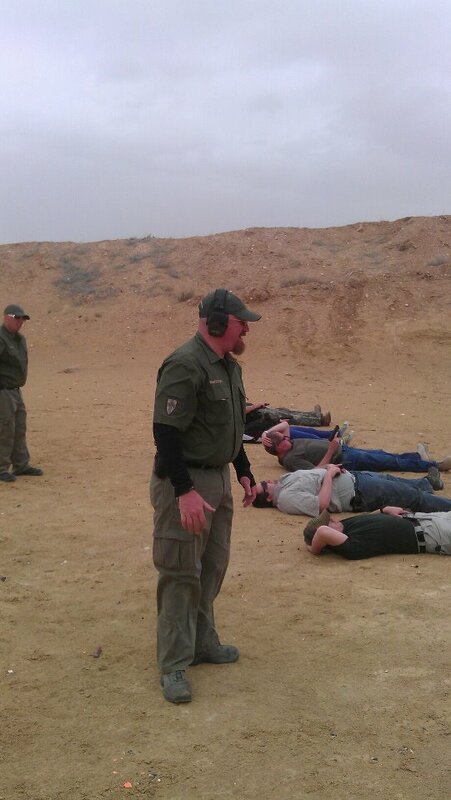 Saturday’s Defensive Pistol Class was the hardest class we’ve ever put on. In the morning, an hour before the class started, we arrived and started setting up the targets. It was a beautiful morning and we were looking forward to having a great day of training. As the students started to arrive, so did the wind. The wind was brutal. We had Veterans from Iraq and Afghanistan that said it was just like over there. 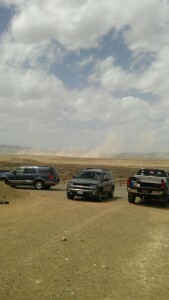 The wind was picking up sand and dust and blasting us all day long. Sand would get in the guns, in your eyes, ears and teeth, and in your sinuses. And that wasn’t the worst of it. We’d watch helplessly as the target boards were snapped off the stands and carried up over the berms, over the mountains. Paper targets that were taped to the boards were shredded, and then ripped off the boards, and then the boards were ripped off the stands. This was the worst training environment I have ever trained in. I wanted to Postpone the class… But the students wanted to train, so we trained. Started out with 12, ended up with 5. The students all did a great job. They worked hard and trained hard in these horrible conditions. One guy was having problems with sand getting into his contacts, but he stayed and trained through the end. What you don't see here, is the Sand Blasting Effect going on. It really felt like being Sand Blasted, it would sting, the skin and eyes. This was unpleasant. With the sand getting into everything, we did have some problems with some weapons. One of the Walthers started jamming very badly and was failing to go into battery with more consistency than not. Sand in the magazines started getting troublesome for an XD shooter. The worst of it though was the sand contamination that brought a S&W Revolver to it’s knees. If there is any lesson to be learned from training in these conditions… it’s that these are the same conditions experienced by our troops over in Iraq and Afghanistan. We expect them to perform in it. Such conditions make doing everything more difficult and unpleasant to say the least. But with following the basic core fundamentals of shooting technique and malfunction clearing… you can overcome the environmental difficulties. These students can no handle shooting in situations like these… they can handle anything. Great job to everyone that attended. But right here is what made this class, as brutal as it was, very special to me. 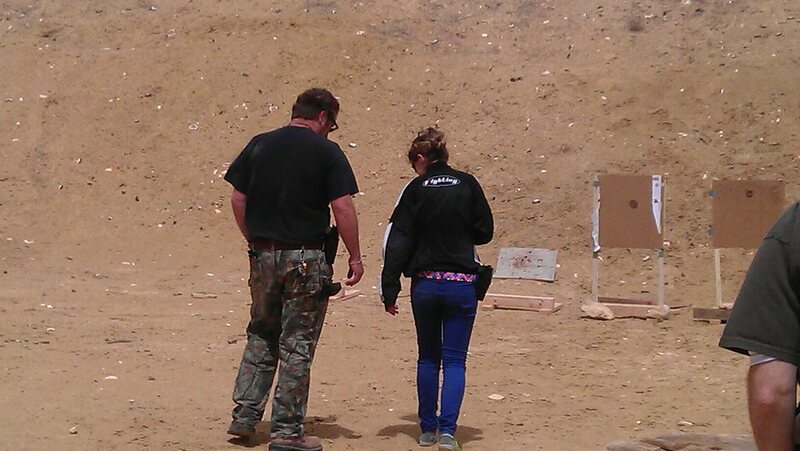 Our good friend brought out his daughter to train. She’s 13. She had never done anything like this before and really took to it. 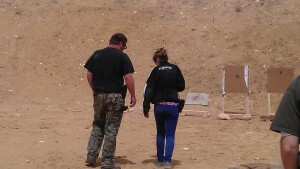 Dad's what else is better than taking your girl training? She did a great job in some of the worst conditions, with a gun that was jamming like a jazz band. Dad was proud of her, fit to bust. I was proud of her too… I’ve known her since she was just a little tiny thing and it’s good to see her being raised right. After the class, some of our Crusader 870 Shotguns came out to play, one had been transferred to a customer the day before and the other was Joe’s personal training gun. The actions were so smooth it felt like I was shooting Semi Autos. Cycling was effortless and fast. There were no failures of any kind and the patterns were good with the loads used. 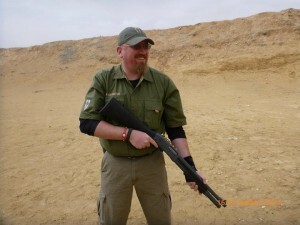 With the Rifle Sights, I was able to pick up targets and engage them fast and accurately, just as fast as with a Ghost Ring set up, but with much more precision. It doesn’t have the Cool Guy winged rear sights that are popular because they look cool… These sights just work better. When you start launching slugs, Ghost Rings are no help. Rifle sights are what you need. I want to personally thank my assistant instructors who were dealing these these conditions and the environmental issues we were having. Joe and Zack, hopefully we never have to teach a Sand Storm again… but if we do – we know we can get it done. "Really? 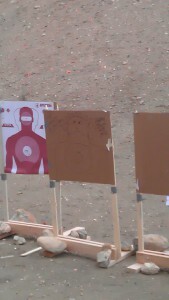 Another target stand blown off the range?" This was not a Fun Day at all. It was hard. It was unpleasant. It was draining. And that’s what Training is all about. Crusader Weaponry has been in the Shotgun business for awhile now. This is what we are doing for our customers who demand the absolute best. We worked on this configuration with leading members of the US military elite. This gun is now being offered to the American Gun Owner. I am very pleased with these guns, and they are one of my favorite weapons that Crusader offers. They are not just affordable, but also shockingly effective. If you can only buy one gun, buy one of these 870’s. 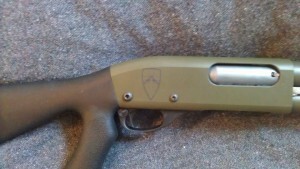 The Shotgun offers a flexible weapon system that is simple to use, rugged, and reliable… and you can engage targets as small as Humming Birds, and as large as a Brontosaurus at ranges out to 200 Yards. Features include a tuned action with our Slipstream treatment. Rifle sights for greater precision with slugs over the popular ghost ring option. Improved spring and follower. Tac Star Side Saddle for flexibility. This gun is of course already spoken for. He’s going to be well pleased with it! 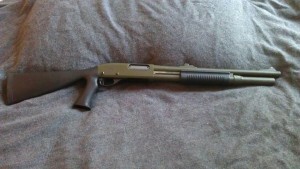 We are offering these shotgun for only 795 USD. If you want one of your own, or have any questions about it, contact Joe at Crusader Weaponry. Crusader Defensive Pistol: May 26th. Self defense and personal safety should never be taken for granted, and Crusader is committed helping you learn the skills you need to survive an encounter. Our Defensive Pistol course is the most entry-level of all our courses and is structured with the novice and intermediate level student in mind. 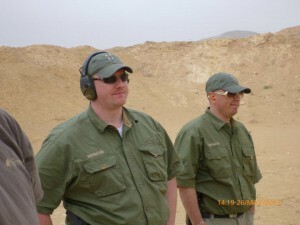 In this course you’ll learn everything you need to run your pistol efficiently and effectively. 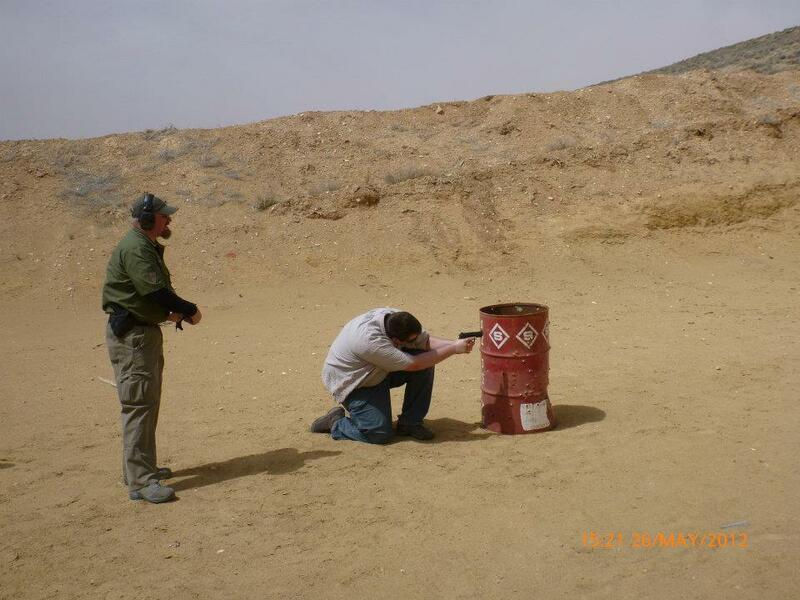 From basic safety procedures and guidelines to aiming, proper grip and stance, trigger control, movement and cover, and tactics, we’ll give you the skills and you’ll run the drills. Consistency, accuracy, speed. These are our goals. This is an entry-level course and as such does not have any prerequisites. If you have special medical needs, inform us beforehand. Appropriate dress for the expected weather conditions. NOTE that our range facilities are spartan, so if there is a creature comfort you want you will need to bring it yourself. Shade, something to sit on… and of course beverages and snacks. We don’t cater. However, after the course, students and instructors alike have been known to congregate at a local Mexican food restaurant for good food and discussion. BE PREPARED FOR ANY WEATHER CONDITIONS. We shoot no matter what, rain or shine! Stop by Tannerman’s Trading Company and pick up some Slipstream! It’s getting awesome reviews by everyone who’s tried it. Crusader Weaponry has teamed up with Lucid to provide a very good optical gunsight for our rifles. When I first tested the Lucid HD7, it impressed the hell out of me. It was clear, solid, and did everything I wanted an optic to do. In fact, it did better than I had hoped. I put it on a number of guns, trying to break it. Including a 12 gauge with slugs. It held up. As far as accuracy goes, it actually improved my accuracy with my own M4. We recommend the Lucid for the best bang for the buck solution for all our 5.56mm rifles. When you order your Bones, Partisan, Templar, or your own custom configuration, ask for the Lucid to come with the gun as a package. Just a little something for all of you guys to remember. Crusader has a Layaway Plan. An Installment plan… It’s non-refundable, but it is transferable to other Crusader products if you change your mind before any special parts are ordered/made/customized. It’s real simple. You pay into it, take the time you need, pay as you can. When the payment towards your weapon of choice reaches a certain point, your build gets started and you have 90 days to pay the rest off and have your weapon shipped to your FFL. Configure your weapon how you want and start making your payments. In tough economic times, it’s a heck of a lot easier than paying it all in one lump sum. 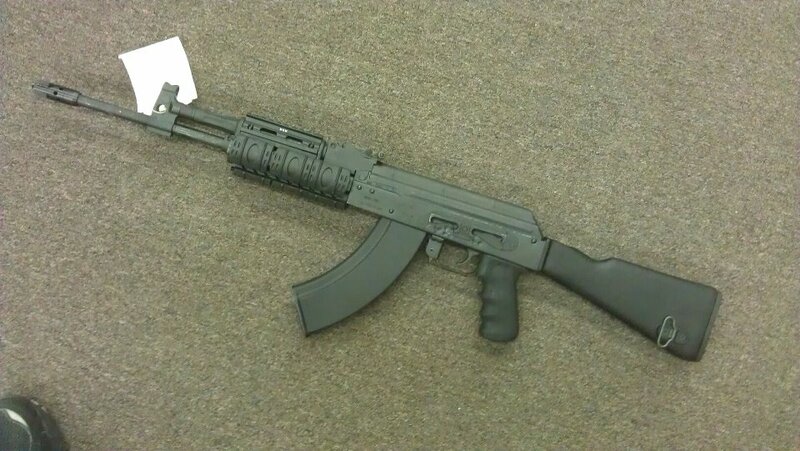 I put an AK-47 on Layaway today. I’m going to need it come Spring Time! I’ve been looking at buying one for some time now, but hadn’t found one that I really liked. Well, I found one. This was built by Cugir in Romania, then rebuilt by M&M LLC. It’s been around the block. Typical WASR10, with some rails and TAPCO stock and trigger, with a Hogue pistol grip. It actually feels really good. Crusader is going to be offering an AK Focus course for 2012. So pretty much I need this, so it’s a justifiable expense. A required expenditure. Also, this gun is going to be the test mule for Crusader’s AK work. What can we do to the AK that gives any actual, tangible benefit… what is going to be worth spending money on, and what’s not. I don’t want to sell anyone on something that’s not going to help… If it’s not, we’re not going to offer it. Now, I have some planned work for it. BattleComp. Lightning Bolt. Ambi-Safety. Slipstream ST-2 Treatment. Serious Dehorning. Cerakote finish. My last Kalash I got was a Vector Arms under-folder from FBMG back when they were in their salad days. It was a great AK… very good stuff. But there were things I didn’t like about it… Sharp edges, thin finish… it wasn’t perfect, but it was very good for an AK. 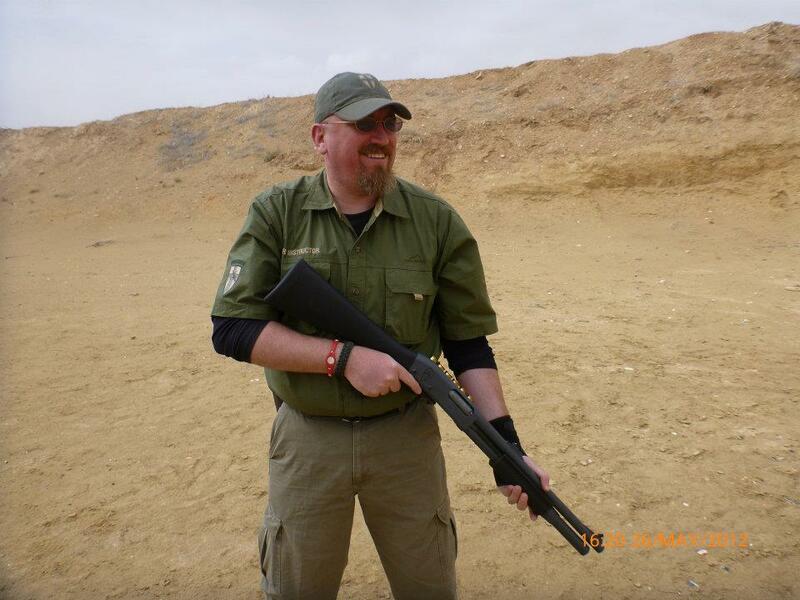 At the time, it was the best AK I had ever owned, and I have had several. It’s a shame that Vector Arms went belly up. If Crusader does get into the Kalash Building Business… this means Utah is going to get a good in State AK again. We’re also going to go into greater focus on the Shotgun. More work on actual slug accuracy, and use of them for barrier penetration. Advanced Shotgunning. I’m also thinking about offering Force on Force, Patrol Techniques, Assault and Ambush. Mounted and Dismounted. Firing from Vehicles, Moving and Stationary. We will also use Guest Instructors. These classes will have some more stringent requirements, meaning that we will only let in students that mean certain requirements. Citizens of US or strong Allied Nations, clean background. We are not going to train anyone if we have any doubt about their character or intent.